Functional fitness focuses on movements that mimic everyday actions. These exercises incorporate multiple muscles groups at the same time for an efficient workout that will improve how your body moves outside of the gym. Our program builds strength, balance and joint mobility along with improving your total fitness at each workout. Our weBUILD group classes are designed with cancer survivors needs in mind but we encourage caregivers, family members or friends to join! Classes use functional fitness exercises designed to increase your strength, lean muscle mass and move better outside of the gym! We know how important nutrition is to feeling great and meeting your goals but it can be confusing! Sit down for a 1 on 1 consult with our nutrition team who understands cancer, find out how to eat right for your body, learn how to shop and even get recipes that you will enjoy. We love for people to visit our weBuild class. In town and want to see what it’s all about or simply want to try a class and see if its for you? Purchase a 1 time drop in and prepare to have some functional fitness fun with a great group of weBuilders! Not ready for a group class or simply want to have a more individual experience? Sign up for a private session to work with one of our coaches. These sessions can be used as your own weBUILD time or we can help you to design an individual exercise and wellness plan for in and outside of the gym. Not the Yoga with incense and mood music, but yoga that will help your body recover from your treatment or daily activities. Our classes are designed to understand the side affects you may have and how mobility may help. Don’t worry we wont yell if you can’t do the downward dog! GYRIG for the New Year! A 6-week exercise program targeted to colorectal cancer pre-vivors, caregivers, supporters and their medical teams to get moving for the new year! Join this group to be active together, learn about wellness including exercises, nutrition, recovery and emotional well-being. Not ready to commit to a monthly program? Be a part of the team without the commitment. 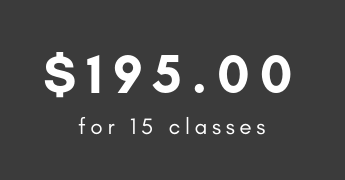 Our punch cards allow you to visit our group classes whenever you want. Each punch card will allow you up to 15 classes to be used anytime you want. Card’s do expired after 90 days. Results are important! This noninvasive Body Composition scale that takes just a few minutes to use and provides your lean muscle mass, body fat percentage, body water. This is a great tool to measure your progress and provides valuable information to help us guide your exercise and nutrition. Contact us to ask about our family discounts and scholarship opportunities to help pay for classes.